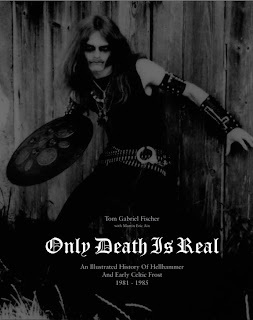 Former HELLHAMMER/CELTIC FROST mainman Tom Gabriel Fischer and Bazillion Points Books have announced November 2009 as the publication date for 'Only Death Is Real: An Illustrated History of Hellhammer and Early Celtic Frost." Authored by Fischer with cooperation from HELLHAMMER/FROST partner Martin Eric Ain, the deluxe large-format 288pp hardcover will feature over 300 astonishing high-quality photos by Csaba Kézér, Martin Kyburz, and Andreas Schwarber documenting the very dawn of death metal and black metal. HELLHAMMER's adolescent hardships were played out in dramatic and sometimes violent episodes set in small villages around Zurich, Switzerland, during 1983 and 1984. The ultimate insider document of the earliest era of death metal and black metal, 'Only Death Is Real' documents this unique and cataclysmic moment in modern music history with hundreds of never-seen vintage images, classic artwork reprinted by kind permission of HR Giger, a full visual reference to HELLHAMMER promotional material, flyers, and memorabilia documenting the birth and evolution of extreme metal—all supported by sharp-tongued oral accounts direct from Tom G. Fischer, Martin Ain, Stephen Priestly, Steve Warrior, and other survivors of the HELLHAMMER inner circle. Things to Do in RVA this Weekend.